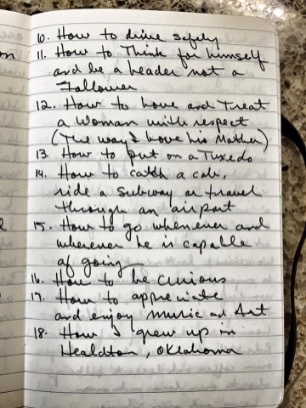 thesuburbwoman - "Things I want to teach..."
"Things I want to teach..."
​With the sunrise three weeks ago today Michael flew to heaven. It feels like three lifetimes. His gift to me over the weekend was finding three more of his journals he had safely tucked away. I always treasured his cards and letters, but they as well as his journal writings are like gold to me now as I wade through emotions and memories. We took a trip to Quartz Mountain Lodge for just a weekend getaway with Sam when he was two months old. 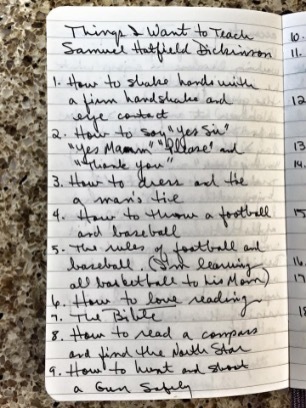 Michael thoughtfully took his time in making a list of things he wanted to teach Sam as he grows up. There was no indication he would have less than nine years to raise Sam with me, but he knew having a child at age 50 meant there was a higher probability he might not see him grow into a man. Sam and I look at this list a lot. He loves that he knows what his dad wants for him - and we've made a promise to make sure he learns all these things the way Michael intended to teach him. We stumbled through learning to tie a man's tie for the funeral and Sam is working on the firm handshake and eye contact. We have throwing a baseball down, we play basketball and throwing a football will happen this fall as a start. Even though all might be normal in your life, I would encourage you to take some time in the coming days to write your wishes, what you're thankful for, and notes to those you love. Put them in safe place where they can be found when they will need it most.